Editor’s Note: This week’s guest post comes from Joe Martinez, a Milwaukee-based PPC expert at Granular who helps clients get the right kind of traffic and turn it into conversions—which requires both the right ads and the right landing pages. Today, he’s sharing what he did recently to boost one client’s PPC landing page conversions 183%. When you’re just getting started with pay-per-click advertising, the path to improvement is often pretty straightforward. You start with clear ads, make sure to use dedicated landing pages, and go from there. But when you already have the basics in place, you can turn your attention to deeper considerations. At this stage, the answers may be less obvious, but it’s also where the real potential for optimization starts. I recently took on a new client who was in this spot. They immediately asked what we could do to increase the paid search performance—even though their current performance wasn’t bad. They were already using dedicated landing pages. But they wanted to make a big push to hit an aggressive quarterly goal, and they weren’t sure their current PPC strategy would get them there. When I looked at this client’s ads and landing pages, I immediately saw a big opportunity for improvement. It wasn’t necessarily something that would jump out to the casual observer, but addressing it resulted in a 183% jump in conversions. The secret? Building and maintaining trust. Here’s what we changed, what our thinking was, and the results we received from my recommendations. If you’re doing any PPC advertising, try applying this framework to all your landing pages and campaigns—I’d bet you’ll see a higher conversion rate, too. I won’t be mentioning this client by name, but I can tell you they provide services in the industrial market. So when I first assessed the ads and landing pages, I saw ads with the following message. Right off the bat, I knew this was an issue: the ads were focusing on what the company does (industrial CNC machining, which they further define in the ad copy). Because these ads appear in paid search … and if someone is searching for the specific industrial products that trigger this ad, don’t you think that person already knows what those products are? No more “what” messages. Apart from the search term, the ad copy focused only on value statements to start building trust with prospective clients. I’d expect this change alone to produce a better conversion rate. But we were just getting started. Ad extensions are already known to be important in PPC. Google has stated outright that ad extensions have a direct effect on your ad rankings. But more importantly, ad extensions are valuable to people, too. You know, the ones who actually click on your ads and convert on your landing pages. So when I’m writing ad extensions and making both Google and users happy, I utilize the extra ad space to boost my value messages and showcase the brand’s dominance. When I started working with this client, they weren’t using ad extensions at all. Here’s how I got them started. Later I’ll talk about why you want to bullet point your value messages on your landing pages, but you can actually use extensions start doing the same thing in your ad. Just like our ad message, the extensions don’t explain what the company does. We are only calling out value messages that will help our target audience understand our authority. Review extensions are harder to get, because they require finding a published review source that Google recognizes. But the extra work is definitely worth it, because they can boost your clickthrough rate by up to 10%. After some digging, we found a source that Google accepted and started showing this extension in our ad. It’s important to keep in mind that review extensions are only good for a year from the publish date of the third party source. If you do any sort of PR work for your company, use these third party reviews as an ad extension to build upon user trust. There are a few other ad extensions I want to highlight, even though I didn’t use them with this client. I still want to show them to you because they can help you build user trust and highlight value, depending on your industry. Seller Ratings: These five yellow stars showcase reviews collected from Google and other third-party sources. Consumer Ratings: These ad extensions work in tandem with Google Consumer Surveys. If your industry-related ratings are high, these scores can show up as an automated ad extension. Price Extensions: This extension is only available on mobile devices. Showcase a product or service and highlight the pricing if you feel it’ll help entice users. Changing our ad message to focus on trust increased our clickthrough rate 195%. But even though we have our desired ad message in place, we’re far from done. Ads can set up user trust and drive traffic, but it’s the landing page that has to seal the deal and convert the user. Now I’m going to show you what I did with the same client’s landing pages to build on these results. We had a banner image (with the page title in it), a product image, two long paragraphs, and a call-to-action form on the lower left side of the page. That’s an awkward spot for a call to action, but the worst part, in my opinion, was the paragraphs of boring content. The only thing these paragraphs did … was explain what the client did. The client never showcased why a user should choose them. It was time for a big change. We needed to make sure the trust messages we used in our ads to originally entice the user were included in our landing pages. Less boring content. More value messages. Within the banner image, we used a headline that not only called out our keywords, but also gave a reason why you should choose this company. Underneath the headline, we added a proof-point banner showcasing noteworthy companies the client dealt with. Because we’d already done such a good job consistently communicating value from the ad through the top of the page, some visitors might already be sold at that point. So right below the social proof banner, we added a call to action. 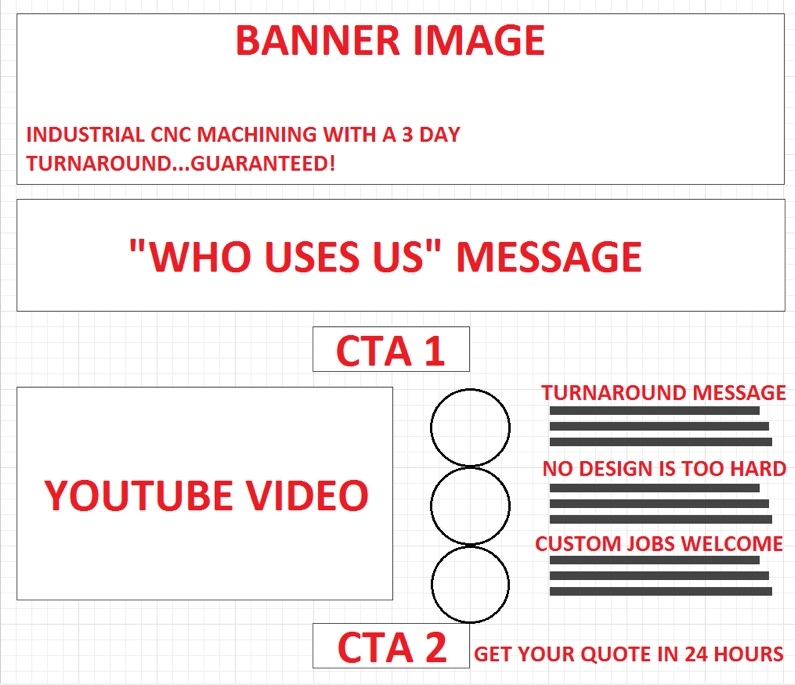 For everyone else, we embedded a YouTube video so users could visually see why my client was so great. Next were three short value messages—the exact same messages we used in our ads. At the bottom, we added one last trust-building element before the call-to-action letting users know they’d get their quote within 24 hours. So how did this new landing page strategy work? Yes, we were constantly testing ads, adding negative keywords, and performing our typical monthly PPC duties—but those are tasks I do every month. This account never saw an increase like this from typical, monthly tasks. It took overhauling our ad and landing page messages. The lesson? Take the time in your PPC ads and landing pages to focus on what really matters: your users. Find out what’s really important to your customers then add value messages to your ad and landing page content to build user trust. If your message connects, you may even see results like the ones my client achieved. Have any questions about creating trust-building PPC landing pages? Leave them in the comments to get an answer.